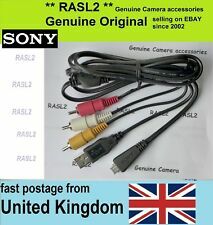 Genuine Sony cable with free US shipping. This cable appears to be compatible with the following models and series E10, E20, E40, E50, E60, E70 /E70L, E75. T10, T20, T30, T40, T50, T60. W10, W20, W30, W40, W50, W60, W80, WS80. Cable only. Item is as pictured. This cable appears to be compatible with the following models and series 50, 50L, 60, 430RS, 450, 550 555 750Z, MX, MX4, WP, WPi, 33WR, 43WR. E10, E20, E40, E50, E60, E70 /E70L, E75. T10, T20, T30, T40, T50, T60. SONY CYBERSHOT - DSC-F77, F88, G3, H3, H7, H9, H10, H50, M2, N1, N2, P100, P120, P150, P200, T2, T3, T5, T9, T10, T11, T20, T30, T50, T70, T75, T77, T90, T100, T200, T300, T700, TX1. Sony VMCMD3. AV Data Cable for Sony VMC-MD3 USB Cyber-Shot DSC-T99 DSC-W350 DSC-TX5 DSC-W380 DSC-W390 Type-3. 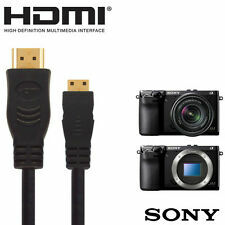 USB AV Cable for Sony VMC-MD3 Cyber-shot DSC-W320. Sony VMC-MD3. Sony Cyber-Shot DSC-T99. Sony Cyber-Shot DSC-T99/B. (Specifics: For Sony Cyber-Shot DSC-S980 DSC-W180 DSC-W190 W310. Item: USB Data AV Video Cable Cord. Type: USB Data AV. ) 2019-02-13. Fantastic \0/ perfect j e ( 950. ) 2019-03-07. Note: Your TV must have HDMI jack for this cable to be compatible. The cable gets the video signal out through HDMI standard output. Type: Mini HDMI Out cable. trademark owner/manufacturer. T he trademark owner /manufacturer does not necessarily. DSC-HX20 / HX20B / HX20V . series. Note: Your TV must have HDMI jack for this cable to be compatible. The cable gets the video signal out through HDMI standard output. Type: Mini HDMI Out cable. Cybershot DSC-HX300 / HX300v / HX300b. series. Cybershot DSC-HX50 / HX50v / HX50b. series. 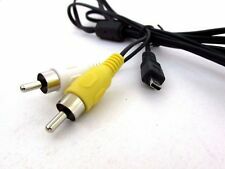 Note: Your TV must have HDMI jack for this cable to be compatible. Type: Micro HDMI Out cable. DSC-WX70 / WX70 / WX70/V . series. DSC-HX100 / HX100 / DSC-HX100/V . series . DSC-WX7 / WX7 / WX7/V . series . Note: Your TV must have HDMI jack for this cable to be compatible. Connectors: USB multi-pin plug male, to 2 RCA AV plug male. Compatible with :Sony part Code VMC-15CSR1 and. This one does VIDEO plus AUDIO! High quality cable Cable length: 5 ft. Heavy-duty cable. Connectors: USB multi-pin plug male, to 2 RCA AV plug male. This one does VIDEO plus AUDIO! High quality cable Heavy-duty cable. Cable length: 4 ft. Twisted-Pair construction to ensure high-speed, error-free transfer. Connectors: USB multi-pin plug male, to 2 RCA AV plug male. Compatible with :Sony part Code VMC-15CSR1 and. High quality cable Cable length: 5 ft. Heavy-duty cable. This one does VIDEO plus AUDIO! Note: Your TV must have HDMI jack for this cable to be compatible. Type: Micro HDMI Out cable. The cable gets the video signal out through HDMI standard output. trademark owner/manufacturer. T he trademark owner /manufacturer does not necessarily. Alpha D-SLR / DSLR A70, A100, A200, A300, A350, A450, A700, A850, A900, Cybershot DSC-H90, DSC-H200, DSC-H300, DSC-H400, DSC-S630, DSC-S650, DSC-S700, DSC-S730, DSC-S750, DSC-S780, DSC-S800, DSC-S850, DSC-S950, DSC-S980, DSC-S2000, DSC-S2100, DSC-TF1, DSC-W180, DSC-W190, DSC-W310, DSC-W320, DSC-W330, DSC-W370, DSC-W510, DSC-W520, DSC-W530, DSC-W550, DSC-W610, DSC-W620, DSC-W630, DSC-W650, DSC-W670, DSC-W690, DSC-W710, DSC-W730, DSC-W800, DSC-W810, DSC-W830. DSC-W300 W200 W130 W120 T20 T100 T70 W55 T200. Sony CyberShot DSC-H3. Sony CyberShot DSC-H7. Sony CyberShot DSC-H7/B. Sony CyberShot DSC-H9. Sony CyberShot DSC-H9/B. Sony CyberShot DSC-H10. Sony CyberShot DSC-H50. FOR SONY DSC-WX50, WX70, WX100, WX150. 3D over HDMI (for supported devices). This is not micro HDMI type D, this is. Mini HDMI type C. 24K Gold Plated connectors to ensure superior signal transfer and maximum performance. 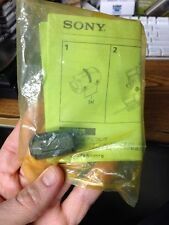 Genuine Sony TDK Zcat 1325-2530. Oxygen Free Copper Conductor, Copper Braid Shielding, EMI & RFI protection;. Cable length:2.5m (8.2 feet). Cable Specifications. 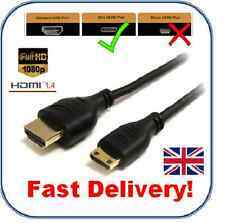 Cable supports 480i, 480p, 720p, 1080i, 1080p, 2K & 4K resolutions;. Black Cable 24K Gold Plated Connectors ;. Sony Cybershot / DSC-W30 / DSC-W35 / DSC-W50 / DSC-W300 / DSC-W200 / DSC-W170 / DSC-W150 USB-AV CABLE FOR SONY CYBERSHOT DSC-W30 W35 DSC-W50. • Cable Length: 1.5m. • High quality and Durable for long life use. Model: AV USB multi-cable. Compatible with Sony Models Sony DSC-W100, DSC-W200, DSC-W35, DSC-W50, DSC-W55, DSC-W55/B, DSC-W55BDL, DSC-W55/L, DSC-W55/P, DSC-W70, DSC-W80, DSC-W80/B, DSC-W80HDPR, DSC-W80/W, DSC-W80/P, DSC-W90, DSC-W90/B. 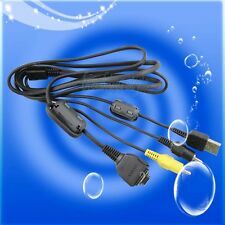 Excellent quality Type A to D Micro HDMI cable. High Quality Mains Cable lead. With your cooperation, we can avoid communication problems. OTHER COUNTRIES. Sony Cyber-Shot camera was released in 2005, but was pirchased overseas in 2006. AC Power Adaptor holds 100-240V/50-60Hz with a UK style plug (G Shape). This product includes Australian adaptor (Type H) working for all types of pligs, shapes and sizes. 1st item £0.00. 2 year Manufacture Defect Warranty. 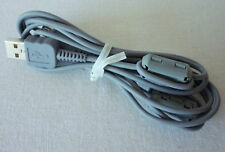 VGA Cables. Fuses & Testers. Security & Safety. 1st item £4.95. Mains Power. Power / Mains. Fuji FinePix A850 / A860 / F20 / F30 / F31FD / F40FD / F460 / F470 / F50fd / S700 / S8000FD / A200 / E323 / E500 / J10 / J150 / J120 / J110 / F70 / F75 / F80 / F85 / A100 / A150 / A170 / A175 / A220 / A225 / AX200 / AX205 / J20 / J22 / J25 / J26 / J27 / J28 / J38 / J210 / J250 / JX200 / Z30 / Z33 / Z33P / Z10 Z10fd / Z20 / Z20fd / Z70 / Z71 / Z80 / Z81 / XP30. FOR SONY DSC-HX7V, DSC HX9V HX10V HX20V HX100V WX30 TX10 TX20 TX100V. 3D over HDMI (for supported devices). This is not micro HDMI type D, this is. Mini HDMI type C. 24K Gold Plated connectors to ensure superior signal transfer and maximum performance.